A visit to northern gardeners. 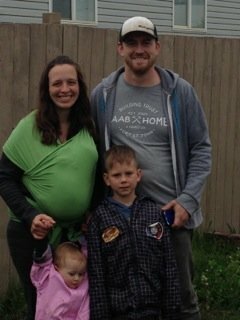 Northern gardeners, Ashlee, Joshua and their 3 young kids (Kaiden, Eliza, Josh) invited me into the home and wonderful garden. I visited in early June when their garden was just starting to grow. I have pictures from then and ones that Ashlee sent to me at the end of July so you have some before and after pics. They live in Taylor, British Columbia Canada, a small town just 20 minutes outside of Fort St. John in northern part of the province. They have only been gardening for only 2 years and I was totally inspired by all the hard work they have put into their garden. They are getting wonderful results and have dreams for producing even more veggies for their family. In their U shaped yard they have several small garden spots throughout their backyard, which utilizes the area really well. 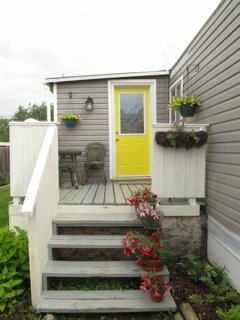 As I walked in through the front gate I quickly saw two areas - the front corner were blueberries, climbing nasturtiums just coming out of the ground and a zucchini plant are growing. 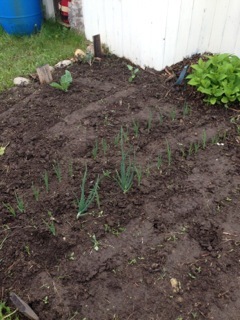 The next area was filled with onions (a good size for June) also a row of beets just popping through the soil. 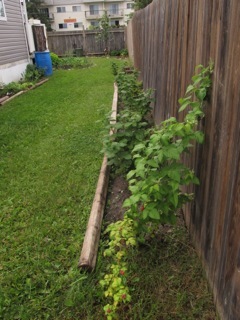 Raspberries, grapevines and an apple tree are growing along the fence as we walk towards the back of the yard. In the back area I saw several raised beds, Joshua had built the raised beds from old pellets. 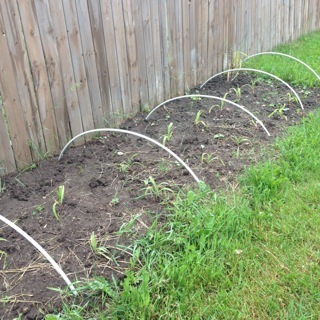 In the raised beds there are growing tomatoes, eggplants, squash, rhubarb, and recently planted asparagus. 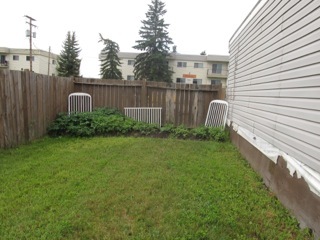 In the centre is a fabulous fire pit and a place for the kid's toys. Last year they had starting seeds indoors at the big front window, but the kids play area became more important so this spring the plants were designated to a less sunny window, and unfortunately they did not do as well - only 3 of their tomato seedlings survived. Since their seedlings did not do as well as hoped they did purchase transplants from a local nursery. I could see about a dozen tomato plants, so I predict they will be harvesting a huge amount of tomatoes. They use eggshells and epson salts around the tomato plants to add calcium to the soil. This gives them a better harvest. It is difficult to start plants indoors due to the lack of light they get, even in a sunny window. Plants like top light so a green house is a better option. 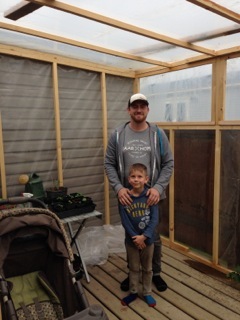 Next year will be a totally different story for starting seeds as Josh built a greenhouse/sun room on the side veranda. 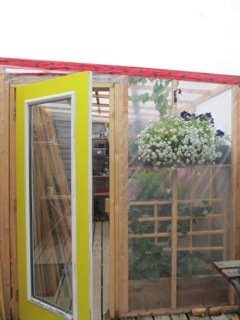 The new greenhouse is intended to start seedlings as well as hopefully grow some vegetables all year round. It will be an experimental process to see how the sun hits the area, how warm will it stay during the winter and what will grow in their winter climate. A wonderful spot to experiment. As I continue my tour with our northern gardeners. 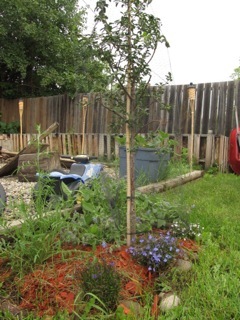 we came across another garden spot, with a plum tree (the birds got to it first last year unfortunately, hence the netting if you can see it in the picture), then i saw a trellis ready to hold the peas planted below and strawberries around the base. 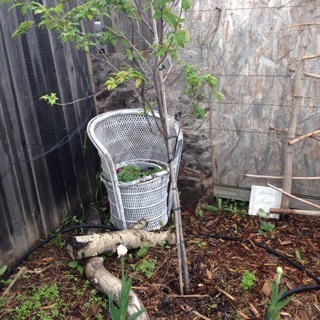 Fruit trees and berry bushes usually take a few years to really get established so they have better harvests to come. All around the yard there have wonderful uses of recycled materials. A small patch was set aside for Kaiden. This reminded me as a kid I was given a patch in my mother's garden where I could plant what I wanted. A great way to get your kids interested in and learn about gardening. 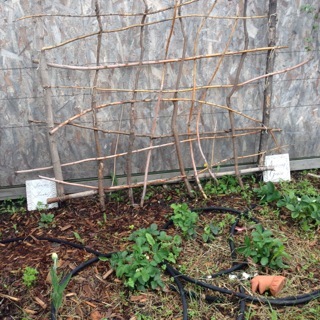 Continuing along, is the "eyesore of the garden" according to both Ashlee and Josh - the compost. Just a big pile of weeds. We chatted about ways to better manage compost, I suggested a 3 bin area built out of pellets, which could be more easily managed. Also incorporating more brown matter will help to break the food waste down quicker. 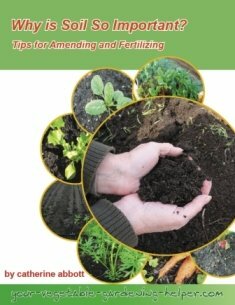 This would give them great compost to add to their garden soil. 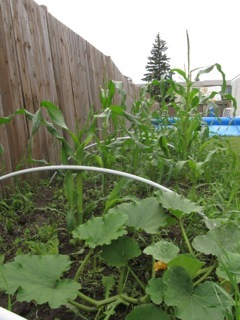 Around the other side of the house was a patch of corn, beans and squash - companion planting. Further along was another spot where their potatoes were growing. 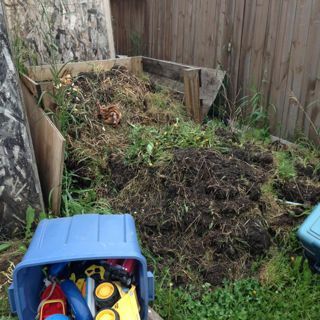 When they first started getting their back yard ready for gardening they found they found a variety of different soil types , some areas were rocky, lots of weeds, and varying levels of top soil. This is probably all too common in new homes, the good top soil is scraped away to make building easier. They have some work ahead of them to increase the soil fertility, however I see them definitely doing this especially if they take the time to manage their compost. 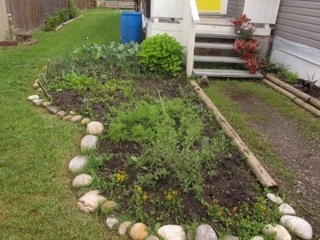 I noticed marigolds were growing among the veggies, marigolds are great for keeping unwanted pests away. I asked if they had any common pest or disease problems last season. Powdery mildew was one problem, they used a mixture of milk and water in a spray bottle to combat this. 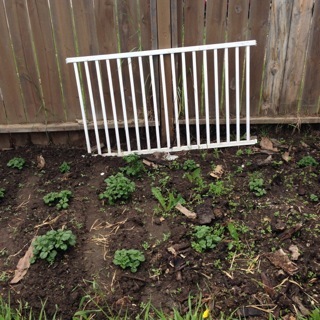 What are these Northern gardeners biggest garden concerns? Mosquitos are one the the biggest problems for northern gardeners, not for the plants but for the humans. While Josh was reading a book to Kaiden they learned that that bats can eat thousands of mosquitos so up went a bat house on the shed wall. Good luck with this, as I had forgotten how much mosquitos love me. 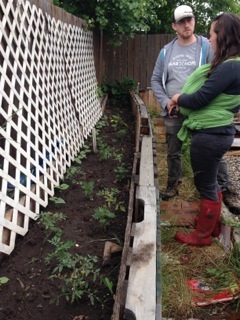 Josh had several questions for me about how I had set up and marketed my own market garden on the Sunshine Coast. He is also inspired by Jean Martin Fortier a micro farmer based in Quebec, Canada and Kurtis Stone an urban farmer from Kelowna BC. Joshua and Ashlee would love to one day grow enough vegetables to sell, which I can definitely see in their future. I visited these northern gardeners in early June, just two weeks previously they had a snow fall! 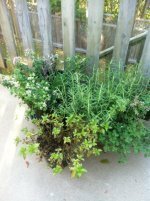 This climate has a very short growing season - from late May to early September, which can add challenges to having a successful garden. Starting early with seeding transplants indoors and choosing the right varieties can make is easier Their garden seemed right on track for the time of year I visited and with the pictures I received later in the summer confirmed they are great gardeners. 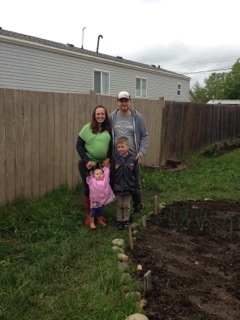 I was inspired by their vision and commitment to producing a bountiful garden for their family. I would have loved to come back as see everything in later in the season for thank you to Ashlee for sending the pictures. Happy gardening to our northern gardeners.